Exemption from punishment or freedom from the injurious consequences of an action. Who said birds of a feather don't flock together ? Kathleen VanBeekom, Faith Sloan, EZBiz QuickCash, WHAT A TEAM !!! How on earth Faith gets such crowds to lead to the slaughter. They have to have never read the actual Bible to believe that Faith has anything to do with the big man upstairs. They have to be some cult followers in the first place. I can remember following her posts on ASA. Most were about her capacity to consume alchohol. She said that her favourite tipple was brandy and she claimed to have had imbibed it in vast amounts . Isn't that more likely to be a man's choice of booze. Women who hit the bottle are more likely to go for sherry or Gin. Perhaps she recruits her followers at Alchoholics Ananomous! Comments from brandy drinkers should make Faith feel more sick than the brandy itself. ANYONE WHO THINKS FAITH SLOAN IS JUST YOUR AVERAGE, RUN OF THE MILL HYIP PIMP REALLY NEEDS TO THINK AGAIN. [QUOTE=littleroundman;15263]Who said birds of a feather don't flock together ? Kathleen has competition!! Oh No!! Maybe Faith could help them index Adlandpro at the same time!! [B]Who said birds of a feather don't flock together ? I have never seen Katleen as anything but a mediocre nonentity on a par with Terry The ******. Is anybody suggesting that she is a somebody? OZ at BehindMlm concludes "100K Race lasted a few weeks, with 5000 Families set to follow suit. That’s if the SEC don’t step in and shut it down sooner… "
With Faith not including the referral URL that's the hallmark of just another player whoring themselves out for referral commissions, OZ presents compelling evidence indicating that both the 5000families.com SCAM and the apparently defunct 100krace.com SCAM may be the personal properties of Faith R. Sloan. 5000 Families Review: Faith Sloan returns to scam roots? The level of narcissism it must take to return to the bank you robbed to pick up that bag you dropped must be powerful stuff. Faith Sloan the Ponzi Queen wants to take your $10 and leverage it into $100,000 just for you, ok? Since she's only allowing 5,000 participants who have to be in by a May 31st deadline, she's only committing herself to pulling $500,000,000 out of her ... hat. Soapboxmom, okosh, Joe_Shmoe and 3 others like this. Hard to believe nothing has been added to this lovely woman's thread in well over a year. Not being a crypto guy, the only things I believe that I've heard are shady: Digitex and Electroneum. I'm pretty sure there are plenty more though. I really wish we had a comprehensive list of the garbage she's been into over the years. path2prosperity, shipdit and ribshaw like this. What a long, slow road it has proven to be to bring this perrenial Ponzi Princess to justice. Thank goodness that she is finally in the frame. I wonder how long it will be before Ken Russo finds himself in the same boat. Royal Dragon Traders just hoisted the white flag of Ponzi surrender. The same scam and same type of promoters as USI Tech, in case people think Bestbud is joking. In your back office: " We have decided to CHANGE the rules of “pay out”........ The bonus trading payment will be bi-monthly, to be precise every 2 weeks,"
Continually changing terms of payment effecting those that ALREADY invested does not inspire confidence and is a sign of desperation and questionable integrity. Now not only will 30% of the agreed upon payout be retailed for a date beyond the initial payout structure requiring reinvesting and loss of an additional 30% later, even the daily deposits will be adjusted to twice a month. ^ While she was waiting for the SEC ... AFTER she was pushing 5000families. shipdit, Fat City, LA, ribshaw and 1 others like this. This is one trial that I am looking forward to following. I have the feeling that all of her continued pimping of Ponzi's after she was told to stop is going to come back and bite her in her assets, among other areas. Just been checking some things about the convicted fraudster Varun Datta when a familiar name popped up as an advisor. Gives you an idea of where pimps make their money. Not from the number of people in their downline, but from the amounts bought in by those under them. shipdit, Bestbud and Daveyw like this. The SEC has filed against Faith Sloan seeking $1.2 Million partial judgment. The SEC also released her deposition she gave on October 4th and November 5th. Faith who could tell all her marks all the different ways they could get paid by signing up when in the deposition couldn't remember how the compensation plans worked for the programs she promoted. She didn't remember she got referral fees for signing people up. She went from this brilliant Internet marketer to total ignorance of how things worked. Of course this is after she deleted all her YouTube videos after being told not to do so. Faith also failed to pay taxes in some years because it was just too complicated so she didn't file. Guess she never heard of hiring a CPA or Tax Specialist to do them for her. If you want to read about some of her deposition and her answers, Oz at behindMLM has extracted some of the most salient ones in his article. Let's just say that she doesn't play dumb very well, but at least they use her deposition against her at trial and could possibly be charged with perjury in her deposition. And just think we still have the trial to look forward to in early February. Soapboxmom, shipdit, Fat City, LA and 1 others like this. shipdit, Fat City, LA and Bestbud like this. 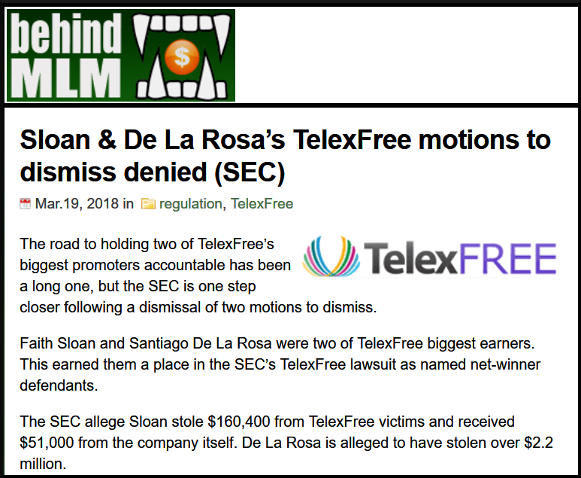 ^ So is Faith Sloan wasting any of her precious time while she deals with the SEC? Nope! Step right up, folks! Faith says that Easy1up is "one of the greatest wealth building deals I've ever seen". okosh, ribshaw and Bestbud like this. Due to the government shutdown, Faith's trial that was to have been this month was moved to March 25. Now this date may get moved again. Faith's attorney is in the hospital due to medical complications and is not expected to be able to return to work at the earliest March 7. The SEC has requested a stay of her March 25 court date, and will file a further motion for new deadlines once counsel is out of the hospital and his health is reassessed. The court still has not issued a ruling in Faith's pending $1.2 million dollar partial judgment motion. Hopefully her attorney will be able to continue and the trial go ahead as scheduled for March 25. Stay tuned.